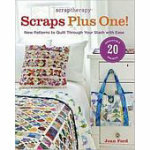 Organize your scraps, fire up your creativity and make beautiful quilts. Learn how to use leftover fabrics and create an array of new quilts. pillows and other accessories Step by step instructions included for a variety of creative quilting ideas.